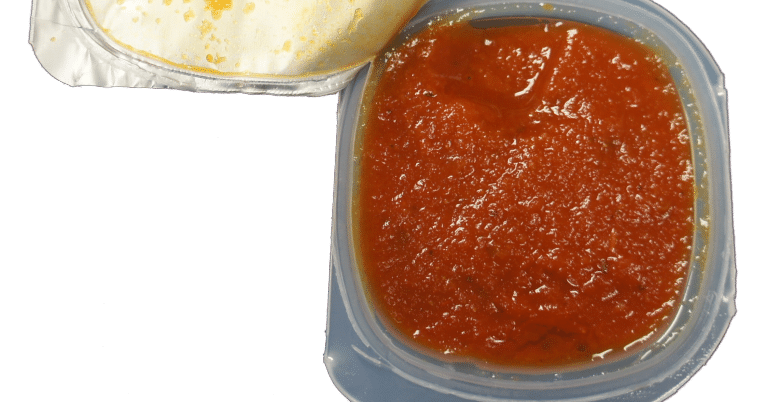 All-Purpose Marinara Dipping Sauce is packed in 2.3-ounce plastic containers. It is a moderately spiced blend of ground tomatoes, diced tomatoes, spices and soybean oil. The sauce is prepared from round and or pear tomatoes that have been washed and hand sorted for quality before grinding. Peeled diced tomatoes are added for character. It is suitable for all dipping sauce applications. This style of marinara sauce has a coarse appearance and contains numerous small chunks of diced tomatoes. It has a bright red color and is practically free from extraneous plant material and objectionable defects. The product is hot filled to ensure commercial sterility then cooled before stacking. Dehydrated Onion, Dehydrated Garlic, Spices, Dextrose, Naturally Derived Citric Acid, and Natural Flavors.